Pride was in bad nick, Cornish Knocker alot better though. Lots of wooden panelling in this small and out of the way pub glimpsed down a side turning from Oxford Street. Two ales on, a traditional sort of public house. 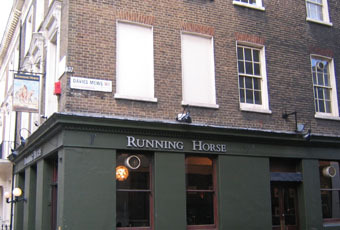 OK sort of place, close to Bond Street tube but just far enough away from the Oxford Street rush to avoid overcrowding. Slightly annoying use of unnecessarily high stools and tables. Pride and Broadside on handpump. Two hundred yards and two hundred light years from Oxford St this is a throwback to the 1940s. Wood panelled room that surely hasn't been decorated in the last 50 years it is a great place to pass a quiet hour. Not much joy in here though for beardy anorak ale drinkers as there were only three pumps two of which were Pride and the last Broadside.